At the age of 101, Bucklin Frankan is the Grand Nauarchus of the Lor Star Navy - in other words, the highest-ranking military officer of the Lor Republic. A slight, trim woman who is about as fit as an athletic Terran woman of sixty, she speaks with the faint accent common to those who've served for years on the Galactic Rim - making her sound (to Terran ears) a bit like late-period Katharine Hepburn. A career officer, she has spent the last eighty years in service to the Lor Republic. Frankan's military background is in engineering - specifically the hyperspace drives common to large military vessels. She earned the first of many commendations when, during her first tour of duty aboard the Scientific Progress, the vessel was boarded in a surprise attack by Rhotic pirates. Assuming command of the engineering deck after her commanding officer was taken hostage by the pirates, the 20 year old officer donned a hazardous materials suit before deliberately venting superheated drive waste directly into the engineering compartments, killing the pirates who had boarded without the protective gear standard for Lor engineers working the lower decks. At the age of thirty, then-Centurion Frankan married Rex Talonis, a civilian communications specialist on special assignment to the Star Navy during the Spinward conflict with the Grue. Talonis took a position on Lor-Van shortly after their marriage to raise their children, allowing Frankan to assume her position as first officer aboard the Republic's Reprisal. A veteran of conflicts with the Grue, Khanate, and various other enemies of the Republic, Frankan earned multiple citations for valor throughout her career, including one memorable incident (that won her the position of Nauarchus) when (as commanding officer of the Reprisal) she redirected the Lorside end of an experimental Grue stargate into the heart of a variable star, the subsequent plasma backwash incinerating the Grue fleet that had been preparing a secret invasion of the Galactic Rim. 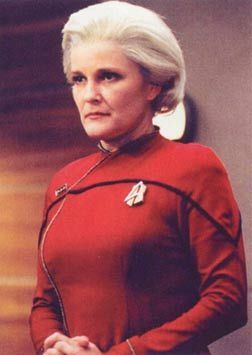 Nauarchus Frankan commanded the Star Navy Academy on Lor-Van for a period of thirty standard years, making her the commandant for the current generation of mid-ranking Lor officers. Her bravery, intelligence, and reputation for integrity made her immensely popular with her students - as did her willingness to show that she carried the same burdens they did. "Grandmother Frankan" is a voice that most high-ranking officers will listen to even beyond the bounds of rank. During a cadet cruise ten years ago, she joined a squadron of Star Knights in the arrest of the rogue knight Blackstar. Five years ago, she was transferred to the site that is still where she keeps her flag - the Grand Shipyards at Altinak C. The highest-ranking survivor of the Communion Incursion, she was promoted to the rank of Grand Nauarchus two standard days after the destruction of Lor-Van. Leaving the war against the Communion to the specialists on the field, she assumed leadership of the 'homefront' of the Star Navy during the war. She has declined proposals by the Senate to move command of the military to the new Lor capital world, arguing that she prefers "the simplicity of a soldier's life" at the Shipyards - something that has only increased her popularity among the officer corps of the Star Navy. Her transfer to the Grand Shipyards five years ago came after complaints were filed with the civilian government of the Republic that she was grooming Star Navy students on the basis of their politics and personal loyalty. Considered something of a self-righteous political zealot by many beings of high rank in the Republic, the forty years she spent as Nauarchus, the lowest flag rank in the Star Navy, were widely taken as a sign that her career had stalled out - until the destruction of Lor-Van made her the most senior officer in the Star Navy. She has taken advantage of the weakened Senate oversight caused by the ongoing Republic recovery to carry out certain personal projects - the better to make sure that the Republic can never again be threatened by its enemies. Or by the weakness of its friends. Her husband, children, and grandchildren were all serving in the Star Navy or living on Lor-Van in the early stages of the Incursion. None survived the destruction of Lor-Van.